The little village of Santillana del Mar, with its cobblestone streets and its ancient buildings, gives you a feeling of timelessness. 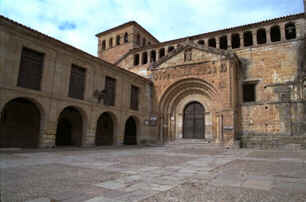 The Colegiata church is from the 12th century. 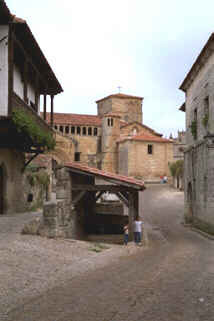 The center of the village is the Plaza de Ramón Pelayo. 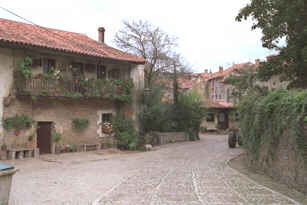 The houses there date back to the 14th to 16th century. In the village, cars are prohibited, but the local people are allowed to drive through to their own parkingplaces. Also tractors can be seen at several times, which (together with loud AC/DC-music from one of the houses) pulls you back to modern times. 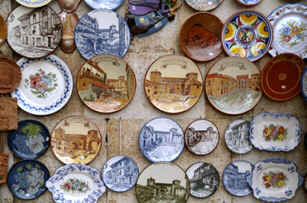 And here are some of the better looking souvenirs: plates with pictures of the village. In front of the church is a well combined with a little stall. This place is favorite for pictures and is also to be seen on a lot of souvenirs that can be bought. During the day the village can look as quiet as this, in the evening lots of touringcars arrive and the streets will be crowded with people. 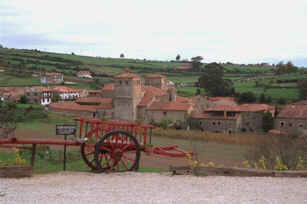 Nearby Santillana the well known Cuevas de Altamira are located. If you want to see the prehistoric wallpaintings, you should request permission at least 10 months in advance by writing to: Centro de Investigación y Museo de Altamira, 39330 Santillana del Mar, Cantabria. Only 25 people a day are allowed inside the caves.